For a long time, I have been against pressure canning and pressure cooking. Pressure canning, at least, is discouraged in Nourishing Traditions as nutrient destroyer (see Legumes, page 495). And traditional food lovers seem to follow an unwritten rule that anything cooked or canned under pressure must be suspect. I am not against pressure canning or cooking any more. Today I want to share why I've changed my tune, plus resources so you can get started, too! 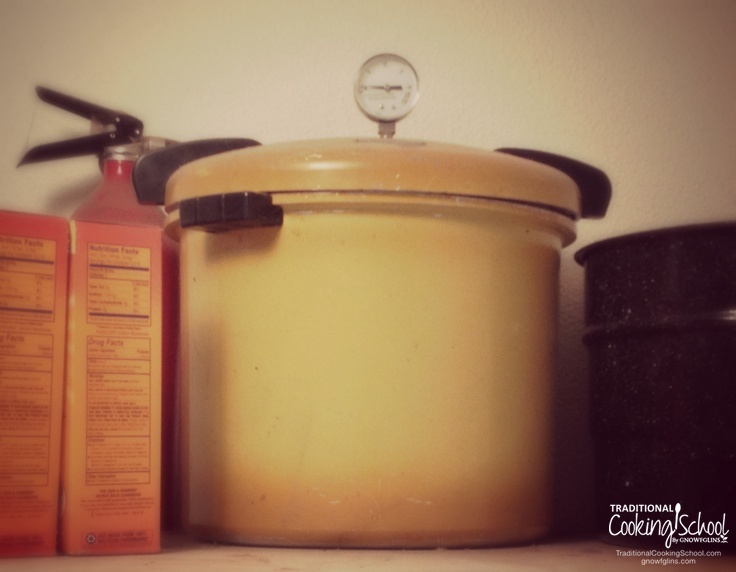 You might be wondering if there's a difference between pressure canning and pressure cooking. Yes, there is. Basically the difference is explained in each name. Pressure canning is for canning food. Pressure cooking is for cooking meals and dishes. Both are accomplished via a pot that's sealed up tighter than your normal cooking pot — which therefore creates a higher-pressure and higher-heat environment. I haven't yet used the beautiful, yellow, almost 40-year-old Presto pressure canner my mom passed on to me — which was a gift from her sister, my aunt, in 1976. It's pictured right there on top of my freezer, next to the water bath canner. It is ready to go, though. A local friend took the lid to the extension office to get it inspected and the gauge tested, and she replaced the gauge and gasket for me. She did all that so I would finally give it a try. I am planning to do that soon. Fast forward more than a year and what really spurred me into looking at this again (yes, I'm slow) was our grass-fed beef experience. This year, we got a tough one. (Or perhaps it seems tough because the previous beef we raised ourselves was out of this world tender and flavorful.) In any case, this year's freezer full of beef is just tough. No matter what I tried — long and low, searing, braising, you name it — it came out tough. Except I hadn't tried pressure cooking. So it was time. My huge, almost 40 year old pressure canner wasn't going to work for this purpose. First of all, it is way too big. Second of all, it's aluminum. And third of all, it's for pressure canning not pressure cooking. So I began a hunt for a pressure cooker. I settled on this 7+ quart Duromatic Kuhn-Rikon pressure cooker (pictured top). On the day it arrived, I tried a roast. It came out so much more tender than before! It was actually very good. I have since pressure cooked whole chickens, beans, broth, soup, and more roasts (of course). They cook up fast and tender. UPDATE: My favorite pressure cooker is now this InstantPot! Seriously — a completely frozen 6-pound pastured chicken is done in an hour and a half. Maybe you're on the fence about pressure cooking. So let me whet your appetite by talking it up a bit! It's fast. Fast as in what might usually take 2 hours will be done in 20 minutes. Already soaked beans done in 15 minutes (or so, depending on the bean type). A thawed chicken in about an hour or a frozen chicken in an hour and a half. A roast in 65 minutes rather than 3 to 4 hours. Nutritious broth/stock in 2 hours rather than 12 to 24. Even vegetables are faster — but I don't see the point in pressure cooking those because they're pretty fast anyway and they can quickly turn to mush if pressure cooked too long. It tenderizes meat. This is especially helpful for wild or pastured meat that could use softening up. I just want to say — not all pastured meat needs this. But this year, ours sure does! Okay, you're convinced, right? I thought so. So it's time to shop around. Thankfully, the new pressure cookers are not as potentially dangerous as the old ones. Their safety features prevent unsafe build-up of pressure, and therefore you don't need to fear explosions. Plus, the newer cookers are more quiet — none of that top rocking back and forth. Remember those? I sure do. Constructed of stainless steel. You're cooking your food in this without the protective barrier of a glass canning jar, so you want a relatively unreactive metal. (Aluminum pressure canners are not a good choice for pressure cooking. However, you may be able to pressure can in a pressure cooker.) Look for high quality stainless steel. 18/10 grade with an aluminum core seems to be a high quality standard. At least 6 or 7 quart volume. You can only fill a pressure cooker up to 2/3 (and sometimes only up to 1/2), so you've got to get one large enough to do a whole roast or chicken or large pot of beans. A tiny pressure cooker isn't going to do much good. Feel free to get smaller ones later — but your main one should be at least 6 or 7 quart. Mine is 7.4 quarts. A good valve design and lid you like. Read the reviews for the models that interest you and make sure you're happy with how they work. When I shopped the Kuhn Rikon models, I noticed they had a few different types of lids. Most of them allow you to release pressure through pressing and holding down the stem at the top of the lid. On the other hand, the “Turn Top” style (which I chose) has a valve you twist, then release, to reduce pressure. I also liked that the Turn Top has two bright red lines indicating pressure (8 or 15 pounds) that I can easily see from a distance — like the next room. Steaming trivet. This is a little insert that goes in the bottom of the pot for when you need to keep foods off the bottom of the pot (so liquids can circulate and to prevent burning). If your pot doesn't come with one, you'll want to get one separately. I can't possibly outdo a good book on pressure cooking in a little blog post, so here I will cover just the basic ideas. You'll want to consult the manual that comes with your cooker, plus purchase a good book. 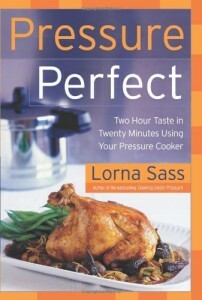 I chose the book Pressure Perfect by Lorna Sass — it covers everything I need. I also have Cooking Under Pressure by the same author. If you can only get one, get Pressure Perfect. I chose the Kindle version for both and I refer to them on my iPad while I'm cooking. Very handy! Release methods. With pressure cooking, you'll find quick, slow, and natural release methods. For all three, you first remove the pot from heat. Then you release pressure through one of the methods. The quick release is done by putting the pot (still under pressure seal) under cold running water. Be careful that the water doesn't go onto any of the valves — which could create a blockage and therefore a strong vacuum in the pot. Slow release entails using the built-in pressure release value to release the pressure. And natural release is simply allowing the pot to reduce its pressure naturally as it cools down (this takes about 20 minutes). Certain foods do best with particular release methods; for instance, most of the time, meats need a natural release and if you skip this, your meat may seize up and get tough. A tried and true recipe will specify which method you should use. If nothing is specified, use the natural release method. Minimum liquid amount. Pressure cooking requires less liquid overall (because it doesn't escape the pot into the air), but you'll still need a minimum. Every pressure cooker is different and your manual will tell you what your pot's minimum amount is. You should always use this amount, plus additional needed for the dish (such as for cooking beans, or making soup or broth). Additionally, in both Pressure Perfect and Cooking Under Pressure, Lorna Sass tells you how to figure out how much liquid your pot loses over time. This is good information to know when you're venturing into making up your own recipes. You'll know after hour 2 that your pot will have lost X amount of liquid. Temperature adjustment and type of stove. When your pot gets up to pressure, you want to lower the heat to where it will maintain that temperature — not over it and not under it. Caution — electric stoves are hard! The burners retain heat even after you adjust temperature and this makes it hard to be responsive to the pressure level in the pot. Here's what happens with me. It can be frustrating, at first. My pot gets up to high pressure, so I turn down the temperature. But it can literally take 5 minutes or more for the pressure in the pot to adjust — and that's simply because my electric burner is still too hot even though it's been turned down. So I work with these things: 1) reducing the heat before the pot gets to high pressure, 2) taking the pot off that burner until the burner cools off (putting the pot on another burner set to low to avoid losing too much pressure), or 3) simply being patient and present and fiddling with the temperature control until I get it right. It isn't the same each time, because other factors at play are the amount and type of food and liquid in the pot. Sizing of foods. If you're going to make stews and dishes with a mixture of vegetables, you have to play with their sizing to get their textures right. They cook at different rates. So one type could be mush while another type is perfectly done. The way to work this is to cut larger pieces of the foods that cook more quickly, and/or smaller pieces of the foods that take longer to cook. Tried and true pressure cooker recipes have this all figured out already — just follow the sizing instructions exactly. Follow tried and true recipes or formulas. When you're getting started, you don't want to reinvent the wheel. Use tested recipes or formulas. For instance, if I'm cooking a roast or beans, I go to the chart in Pressure Perfect where she's got it all laid out. (There are even adjustments for if the beans are soaked, if the meat is frozen, and how much time to add per additional pound, etc.) Do it the prescribed way first, make notes, then adjust if you need it. I have found that I prefer meats and beans cooked longer than the formulas. But at least the formulas give me a starting point. I am so excited to hear what you do with pressure cooking. If you're already a pro, share your tips in the comments. If you're a beginner, let me know how it goes. What do you think? Pressure cooking sound intriguing? Got any questions? Please share in the comments! I have been hesitant to use my pressure cooker for meat. Thank you for this post! I’ve done some pressure canning. My husband had me doing several meals in a jar for the sake of being prepared for whatever. We didn’t usually eat those on a regular basis but all the same I wondered about the nutritional value. I don’t have a pressure cooker but now I’m wondering if it would be a good thing to think about. Meals in a jar is a GREAT idea! If you did want to use your cooker over an open fire, you could use the method we used as Camp Fire Girls (back in the 50’s!). Make a paste of dishwashing powder and a little water and coat the outside of the pot with it. that is…before you put the pot on the fire. This is one area of healthy eating, nutrition, etc. that I’ve never looked into but completely written off as unhealthy. It just sounds so processed!! I’m thankful for your insights & look forward to looking into this more in the near future. With a family of 6 quickly growing children any time saved in preparing food would be a blessing, especially when nutrition isn’t compromised! Micah – Yeah, it does sound processed, doesn’t it? But the thing is we’re cooking these foods anyway (and at varying pressures depending on geography), and a pressure cooker is just a tool to help the process. It’s much like using a blender or mixer, you know? I wouldn’t say that about drugs or other “tools” but in this the pressure cooker “tool” is healthy and efficient so I’m excited about it. Wardee, you’re making me regret my decision a few years ago to sell my pressure cooker after reading Nourishing Traditions. I do miss the faster cooking! I had an electric pressure cooker (which I preferred to the stovetop kind, but which wouldn’t work off-grid) with a nonstick-coated pot (which I’m glad not to be using anymore). I’ve been rethinking the whole thing, and someday I might invest in a better model. I had one of Lorna Sass’s books, too, which I sold with my pressure cooker. Sigh. However….I LOVE to pressure can! Love my All American canner, much better than the one my Mom had when I was growing up…it always scared me. I can things a lot, (doing chicken broth now…and did some pinto beans a week or so ago) cause I don’t have enough freezer space, (which seems silly since I have two freezers plus a couple fridge’s with freezers LOL) and then I don’t have to remember to get it out of the freezer to thaw, which is a big plus. What I can, would be cooked anyway, so I figure there is nothing wrong with canning it over freezing it (not that I really know much about that end of it LOL). 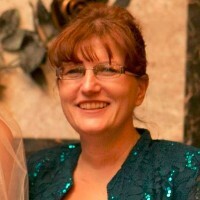 Deb, thanks for sharing what you do! One of my goals with the pressure canner, like you, is to free up what’s in the freezer. And like you, I am going to can some of what will be cooked anyway. Love love using pressure cooker (and canner. I threw in several tough pork roasts and an hour later I have pulled pork for the whole family. I love peeling and cutting broccoli stalks and making a soup with them. None knows it’s the stalks. I make fake refried beans. With a pressure cooker and a stick blender I’m done and cleaned up. I often do chicken broth in the too. It’s funny but I have water bath canned for years, learned from my mom and make dill pickles, pickled pepperoncinis and jalapenos. I joined a canners Facebook page and most of them pressure can everything from beans to meat, to goulash..I’ve always known that to can tomatoes they have to be pressure canned and frankly I’ve been on the fence for about a year…debating on whether or not to buy a canner/cooker. I got an unintentional snubbing of my pickles from my daughter in law who asked if they were “vinegar” pickles …and I was lost at the reason for her question…until months later when I understood the gist behind her question…they were not fermented. She has gotten me into making my own kombucha, I’m trying my had and fermented sauerkraut this weekend after eating hers and I’m most curious about fermented pickles which I will try making too. We hunt deer for meat and venison can be pretty tough sometimes, so now I’m pretty intrigued with the idea of pressure cooking some, because I’d truly love to cook a roast without it coming out dry or tough or both. While I was questioning my canning methods for awhile, I’ve come to terms with it for some basic reasons…water bath and pressure canning have a shelf life vs a refrigerated life and while I’ll continue the water bath canning and try my hand at pressure canning, I will keep fermenting in our lives too. I was just telling a gal on the canning site last nite the benefits of fermented sauerkraut over canned…too funny! I have never canned, nor my mother or grandmother, tomatoes in a pressure canner. They are acidic unlike vegetables which have to be pressured canned. Remember a tomato is a fruit. My mother in law water bathed her vegetables and I would not eat them after I found that out although none of us died and she lived to be 92. All of her neighbors and family canned that way but perhaps they boiled them a long time in the canners. As for wild game, I did can venison once from a recipe from a cousin just to try. Wish I still had the times it took to can it. It was simple: cube your meat to pack the quart jar, add one bouillon cube. No liquid. Pressure canning draws the juices out of the meat. Now I just freeze the venison, elk and antelope but I should go back to preserving some of the meat that way. I always had it in the back of my mind if something awful happened, I would be canning all my freezer meat so it wouldn’t spoil. I have a generator, 2 burner huge propane outdoor stove while my stove oven is gas on top, with a convection/electric oven and can also run on propane if needed. First time I used a pressure canner I was in HS taking care go my 6 siblings while my mom was in the hospital. I thought I had watched her enough to cook some meat. When it was done, I tried it take the lid off. With at first turn, the pressure caused my dinner to explode from the pot, hit the ceiling and fall back everywhere including some back into the pot. I got slightly scalded from the steam. Apparently, I did not watch my mother carefully. Thanks for sharing how you used to do wild game. Pressure canning cubed meat is one of the first things I’m going to try with the pressure canner. Barb — I totally agree! Pressure canning won’t eliminate drying or fermenting (we would miss our ferments too much! ), but because of that shelf life and the fact that certain foods will be cooked anyway, canning seems ideal for many foods. I started pressure cooking a couple of years ago and don’t know how I ever got along without a pressure cooker! They’re efficient, save energy, you can use less expensive cuts of meat, and everything tastes better (even when cooked in it’s natural state). From my point of view, if you’re not microwaving or dining out and you’re eating real, whole foods, you’re already way ahead of the game. Oh, and hippressurecooking.com IS a wonderful site! Agree!!!!! No one I know uses one and they think I’m crazy. That site is awesome. I just used it again today. Pressure cookers also make perfect hardboiled easy to peel eggs from fresh eggs. One cup water….steamer basket….Low pressure. 6 minutes. It’s the only way to do it. Check out hip pressure cooking blog post about it. Of course not all these sites follow Nourishing Traditions practices but you usually can figure out how to make the necessary changes in ingredients. I just got my Instant Pot and am still learning the ins and outs of it all. I don’t have a pressure cooker, though I would use it if I did. However, I do a lot of pressure canning every year. We try to eat as best as we possibly can, and living in the Midwest means we can’t grow produce all year long. So, we eat fresh out of the garden as much as possible and put up enough to get us through the winter. I always felt that since we garden organically, it was a much better choice financially and health-wise than trying to find organic veggies that are not from China. Plus, there are always so many recalls on veggies. I’m glad to hear the science is now backing up the theory. 😉 I have also canned meat on occasion that we buy from the farmer. Sometimes I can my stock if my freezer is full. I’ve also canned beans and things like that. I love my canner! As a matter of fact, I usually have two pressure canners going at once during canning season. The current Ball Blue Book has a recipe for baked beans. I’ve been meaning to try it. I was just wondering about beans too, but cooking them. I have an aluminum pressure canned so I don’t want to use it for cooking. Wondering if I can put a pot or bowl inside the cooler and cook beans in that? Or a quart jar without the lid? In a nutshell, the PIP method uses steam in the pressure cooker to heat/cook food inside a heat-proof food container (Pyrex/oven-safe glass, stainless steel bowl, oven-safe ceramic or Corningware). The steam is created by water in the pressure cooker. The food container sits above the water on a trivet or steamer rack. You’ll You’ll need calculate how much water to put in the base of the PC (not the same as the water to cover the beans) – consider the length of time you’ll be cooking the food and the amount your PC loses during cooking (higher loss % rates for pressure cookers that emit steam from the lid, obviously). I use the PIP method all the time to cook or reheat small quantities of different foods in rapid succession in my Instant Pot without having to wash out the liner pan each time, especially for breakfast when one person wants oatmeal, another wants a plain soft cooked egg (in the shell), and another wants eggs en cocotte (baked eggs in a dish). I sometimes cover the interior container with aluminum foil if I don’t want steam to add additional moisture to the food (eggs en cocotte). I haven’t tried to cook beans with PIP method, though. I would suggest trying a smaller batch with presoaked* dry beans first to test the method in your canning PC. Presoaked beans are already fully rehydrated and expanded prior to cooking, so you’ll be less likely to have problems from bean expansion or not enough water, which might occur with unsoaked dry beans. Discard soaking water and cover presoaked beans with fresh water in the interior container. Several months ago I ordered myself an InstantPot (electric pressure cooker). It has a stainless steel liner and can also be used as a slow cooker. I have been nothing but impressed. Meals are quick and flavorful and tender. We had the same issue with our grass fed beef but with the pressure cooker it is no longer an issue. My biggest selling point: I can pressure cook a whole chicken, feed my family, pick the meat off and put the bones back in the pot, add water and 30min (at pressure) later I have thick bone broth that gels beautifully. That alone made it worth the cost. And while the electric one is not usable off grid, on grid I find that it uses less electricity than my electric stovetop. I tested it with a Belkin Conserve Insight monitor. It also makes great soups/chili/rice with little effort. The newer model InstantPot advertises a yogurt making feature but I do that my old way for now so I can’t speak to it. Oh and it has a sauté function so I can sauté veggies or brown meat before pressure cooking. I am not affiliated with them or anything – I have just been really happy with mine and found it to be super useful (and no stove watching which is helpful with kids keeping me busy). Katie — The InstantPot sounds like a great tool! Thanks for sharing! Ditto the instant pot. LOVE mine, and the stainless pot is easy to clean. You can even make yogurt in the new ones–up to six quarts at a time. It also makes rice. My grandma’s pressure cooker exploded on the stove when I was present, and I’ve been terrified of them since. But the electric pressure cooker is very safe and easy to use. I have an instantpot too, and I love it. Question for Katie…..do you use ‘low pressure’ for bone broth? Wardeh, give me some tips. I can never get my broth to gel. I use organic chicken frame, or backs for the broth. Thanks! Gelled stock from bare carcasses or bones is difficult and does not always work. I always make sure chicken stock has trimmed fat and skin, wing tips, tail, neck, backbone with the carcass. I use a high ratio of bone to water, by packing in the carcass and other items and adding just enough water, plus a splash of vinegar to get more calcium. 40 minutes is enough time, but 1 hour is OK. A natural release will give a clear broth that will gel in the fridge. I do vegetable broth, with herbs, in 25 minutes, natural release. More time and the fresh flavor and scent dissipates. Fish or seafood broth is really intriguing. Fish heads are important for the gel, along with a selection of carcasses, aromatics, shrimp heads and shells, and a splash of vinegar or white wine. It will be done quickly, in 25 – 30 minutes, with a natural release for clarity. No one has mentioned lobster yet , so here goes: steam them with a trivet and one cup of water; Drop in two 1.5 lb lobsters and bring to pressure, steaming for 8 – 10 minutes. They will be cooked through, and the hot shells will keep the juicy flesh warm for a leisurely feast. It is more practical than boiling 10 quarts water in a stock pot. Thank you for this! I’ve always continued to use my pressure cooker even after I read the downside according to Nourshing Traditions. It’s so much faster and uses way less propane to cook foods that would normally take hours to prepare. This post wants me to get all our pressure cookers spruced up again with new gaskets and such. I have one I worked really hard that needs some love. Thanks for this informative, resource rich post???? I have a Fagor set with a small and large pot and a pressure lit and a glass lid. I use the the small pot for soups I’m going to purée, root vegetables I’m going to mash, congee (rice cooked in broth to a porridge consistency) and cubed or ground meat dishes I might otherwise braise. I’ve done more tender vegetables a couple time but tend to prefer those very lightly steamed. Michelle at Nom Nom Paleo has a good recipe for Asian greens and mushrooms in the pressure cooker and other pressure cooker recipes. The large one is used most often for cooking whole chicken, making large amounts of soup and making chicken broth or beef broth. I don’t eat beans but husband does so I occasionally make a pot of beans and portion those out to freeze or dehydrate. America’s Test Kitchen has a new pressure cooker book that I like and it’s available electronically. Their bean timings aren’t long enough for husband’s taste, though. Thanks for the info and reminding me of a couple other sites for info/recipes. I have only been cooking with pressure for 8 months, but I’ve become hooked on pressure cooking. I use an Instant Pot DUO. It’s used nearly every day, often several times in a day, as much in the summer months for steaming veggies and cooking beans and lentils for cold salads without heating up the house, as in the winter season for creating single pot hearty stews, braises, and soups. The ATK book was my first pressure cooking book, purchased before I even had a pressure cooker. I’ve read the book thoroughly several times, especially the first 25 pages of information. Since buying an Instant Pot DUO (which unfortunately was not tested by ATK) and learning how to use it, I’ve expanded my collection of PC cookbooks to a dozen, several of which provide far more complete information about general PC cooking and advanced PC cooking techniques, not to mention a better selection and range of recipes. I’ve noticed that over the past 6 months or so, the ATK PC book isn’t one I reach for often; it usually remains at the bottom of the book stack, along with two other less useful PC cookbooks. I’ve had to make many notes in the ATK book margins where its suggestions & tips for ePCs haven’t worked well for my IP DUO ePC, such as where ATK testers/editors actually misunderstand how ePC automatic timers work and as a results provide incorrect cooking time advice. While there’s some good information in the ATK PC book, but there is also much misleading and even wrong information about how to use PCs, esp ePCs. Many other reviewers of the ATK PC book have come to a similar disappointing conclusion. Additionally, the ATK PC recipe collection is rather limited, with no desserts whatsoever (cheesecake and other desserts that are conventionally baked with the bain marie/water bath are superb when pressure steamed in a PC). I was very surprised that the ATK didn’t make use of more advanced PC methods, such as interrupted cooking for ingredients that require different cooking times for optimal textures, the PIP (pot-in-pot) cooking and reheating method, or pressure steaming foods like soft and hard cooked eggs in the shell, which are so easy to peel when cooked in a pressure cooker, even if the eggs are very fresh. Thanks for the article – I’ve wanted somebody to write this as it’s a concept I’ve struggled with. I really want to pressure can broth (to free up the freezer as you mentioned above). So you’re not concerned about the nutrients in the broth being affected by pressure cooking and then pressure canning? Thanks for your input – very much appreciated. I’ve been pressure cooking for over 40 years, in the US and overseas. I have used gas ranges and electric ranges and both work well. You just have to be aware of their idiosyncrasies. Cooking on an electric burner I use the heating up time to do other kitchen tasks and keep an eye on the stove. When the weight begins to jiggle I turn the heat down and watch to make sure it does not go too fast. When I am canning, as soon as the pressure gauge reads 3 pounds less than the recommended pressure I turn down the heat. Each stove is different and when we bought a new electric range a couple of years ago, I had a learning curve to know how low to turn the heat to keep the pressure constant. Then I set the timer. I am glad you have discovered the benefits of pressure cooking and canning. In canning, I always believed the possible loss of a small amount of nutrients was minor compared to the chance of getting food poisoning. Just my opinion. I like the idea of a pressure cooker with a gauge so you can see how many pounds of pressure are in it. At age 21 I was badly burned when I opened one still under pressure. I had checked it, cooled it in cold water, and when I opened it the scalding contents blew into my face and all over my arms and hands causing 2nd and 3rd degree burns. Turned out a bean skin had blocked the stopcock so the pressure could not escape. It took a long time to heal, and my skin is very sensitive. I started using one again awhile later and learned to can beans and other things in a pressure canner. I am ‘overly careful’ with them, though! Don’t ever want to repeat that experience! Be careful!!!!! I have been pressure canning and cooking for over 20 years. I was disappointed to see Nourishing Traditions negative recommendation. My experiences with pressure cooking have only been positive so all my canners/cookers will all stay with me. My recommendation is to check into converting your pressure canner to a weighted gauge. In Ohio our extension office used to check the dial gauges for free. They now charge $5 per lid times 4 is more than I’ll pay. Plus I’d replaced several dial gauges per their testing (a deviation of 1 degree or over needs replaced) and costs $15+. So this forced me to re-read the OSU canning booklet. Eureka! A weighted gauge never needs checked. I ordered parts from All-American to convert all (even a Presto) over to weighted gauge. The holes/threads are standard. The dial gauges stayed in place but are not used. We replaced the petcocks with a stem and weighted gauge. Especially with an electric stove the dial gauge is so, so, so much user friendly compared to dial gauge. A few months ago I moved from a older 4 qt. Mirro cooker to America’s Test Kitchen recommended Fago Duo 8 qt. Very happy with the choice with twice the capacity, easier operation, quick release, and 8# or 15# pressure setting. Great for Natto, rice, beans, and meat. The Fagor has a silicone gasket that does not always seat properly. Trying to figure out what I can do to help remedy the issue. They recommend oiling the gasket but that seems to make it worse so I’m oiling the metal tabs and it seems better. To ensure the valve does not get blocked by bean skins; cover beans with a piece of cloth(muslin) or a silicone disk. OSU says that pressure cooked tomatoes will be more nutritious. My neighbor used to water bath green beans for 4 hours (overnight) all because of her fear of pressure canners. The ONLY way to can green beans safely is under pressure. I pressure canned my tomatoes and felt they came out much better than when I used to can them in the water bath. Not only did I feel it better preserved the nutrients, but they seemed to keep their color and shape much better. I’m not sure where I heard about it, maybe from the 21st Centry Homekeeper, but someone was pressure canning dry beans. They just added water and pressure canned them. No soaking, draining, etc. What do you think of that? My friend of mine does this. I want to try it! I have heard of this over the years, but have yet to find INSTRUCTIONS on doing this (although I would still want to SOAK the beans first). I can only find instructions for cooking the beans and THEN canning them (in other words OVERcooking them). Anyone know where to find this info? I don’t have the times, but my friend does the dry bean method. She just throws the dry beans, spices and water into each jar and PCans them like that. Best beans I’ve ever tasted in my life. Perfect texture. I’m hoping to go learn from her so I’ll let you know. I am still curious if they *should* have a soak first, but either way it was easier and delicious. I love using my pressure cooker for beans and meats. It does a great job, even if the beans are old or the meat not so tender. I have used my pressure canner a ton for canned meats. With 7 children, it is a great time saver to have the meat portion of the meal already cooked and ready to add to- spaghetti sauce, lasagna, tacos, hawaiian haystacks, soup, sandwiches, chili and so many other things. And the meat is so tender. One pint is one pound- and that is enough for 1 meal for my family if I add vegetables to the meat. My older children and husband can cook up a great meal with not much effort by using the canned meat- that is a great help it they can cook sometimes. With the larger pressure canners you can process 18 jars at a time- it goes by quickly. I love all the information on you blog. Keep it coming! Hi, Wardeh, I am relatively new to your site, have just been working through the free videos so far (thank you! ), but I have been wondering why you didn’t have any pressure cooking info for the last week or so. I have not used mine much, but just lately I have done pot roast, beef for beef and noodle soup, beef broth and a whole chicken in mine. The pot roast came out delicious and so much better and less greasy than crock pot roast. My husband raved about the beef flavor of the beef and noodles, too. I was less thrilled with the beef broth, but I think I didn’t keep it under pressure long enough (I used Nomnom Paleo’s instructions) so I will try again. It is such a great tool for whole foods cooking, especially for procrastinators and non-planners like me! 🙂 And just today, I was considering getting out the canner for spaghetti sauce. I am not sure if I’ll have to pressure it or not, but with meat included, I think it would be safer. I grew up canning, and mostly we used the pressure canner for green beans. Mom would occasionally put up some stew beef. I don’t really like canned green beans any more (you really have to cook them to death), but it is a good way to preserve some meat outside the freezer and can really shave time off of some nice soups and stews. My mother in law got an Emeril multi-cooker for Christmas and has raved about it ever since. I would love to get an Instant Pot, but since I already have most of those appliances in their separate form, I’ll wait until something conks out. FYI, Ball says that the breaking point for and acidic/low-acidic (low-acidic foods require pressure canning) food is a pH of 4.6. I am a fourth generation pressure-cooker user! I wouldn’t know what to do without one! I grew up with my great-grandma, grandma and mom cooking all kinds of vegetables from the garden in just a couple of minutes. My mom gave me one the first Christmas I was married. That was 27 years ago. I love cooking soups, and whole meals with meat, potatoes and vegetables in very little time. Pressure cooking is very healthy. You’re basically steaming your food under pressure (unless you are cooking beans or soups). I gave a pressure cooker to my son and his wife for their first Christmas this last December. After four months of marriage my son said he already missed having one. If you’ve never tried pressure cooking, don’t be afraid! It’s very easy and there’s nothing to be afraid of! Are there any stainless steel pots that are dual purpose, both pressure cooker and pressure canner? Yes! I am saving for an Instant Pot after reading so much about it on Nom Nom Paleo. This is a great comparison about pressure cooking and pressure canning – I see you mentioned food renegade but another great source of whole-food recipes is the hip pressure cooker website. I followed the free “learn to pressure cook” course, there and I’ve been pressure cooking everything ever since. Also, at least my pressure cooker, can be filled up to 2/3rds of the way. I don’t know about others that only need 1/3 full as you mentioned but I’m sure that’s a question the hip pressure cooker lady can answer! Wardeh, are you pleased with the size you bought? I am tempted to buy the 12L one in order to make oodles of broth (my primary reason for buying one) but I’ve seen hippressure.com steer one away from that. We have 5 adults and 3 preschoolers in our household. My household is smaller, only 3 ppl, but I find the Instant Pot pressure multi cooker 6 liter capacity to be more than ample for just about anything I prepare in it, with capacity to spare. I can can make several quarts of chicken bone broth in the Instant Pot in about 1-2 hours that is equal in every way to the larger batches of slow cooked bone broth I used to simmer in a very large slow cooker for 24+ hours. Most often I start it after dinner or shortly before going to bed (I always check that it has reached pressure first). When the pressure cook time is up, it switches to Keep Warm for the rest of the night. In the morning I turn the IP off, remove the liner pot and let the contents cool enough to strain the CBB into jars. On the very rare occasions I need more broth, I just make two consecutive batches. But more often than not I just make smaller batches of CBB more frequently instead of making large batches and storing them; saves on valuable freezer and fridge space. Pressure cooked CBB just saves so much time, storage space, and energy, plus we don’t have put up with the lingering smell of bones simmering throughout the entire house! It didn’t take long for the IP to pay for itself in various savings. I use vegetable broth less often than chicken bone broth; now I usually make VB only when I need it or when I have excess veg that I don’t want to store in the freezer until I can make broth, since the amount of VB I need can be made so quickly on demand with a pressure cooker. how hot is Keep Warm? I know a crockpot is not hot enough on Warm to keep things more a couple hrs. I use my 6 Qt. Stainless PC several time a week. My boyfriend tells me that I am the only person he’s ever known that can cook an 8-Pound hard frozen chicken in an hour and have garlicky chicken and dumplings on the table in another half-hour. He says he loves chicken and dumplings,,,, but,,,, Garlicky chicken and dumplings,,, well,,, he says those are a religious experience. He’s marriage material,,*sigh*. I was hesitant about pressure cooking for several years for the reasons mentioned in Nourishing Traditions, too. But I was tired of my house always smelling like a broth factory with the slow cooker constantly brewing bones like a witches cauldron. I looked further into how pressure cooking actually works, and who advanced the newer pressure cookers are compared to the one my mother used in the 60s and 70s, and reconsidered my earlier negative stance on pressure cooking. Stephan Guyenet’s Whole Health Source blog post in 2012 about his very positive experience with the electric Instant Pot pressure multi cooker completely tipped me over the fence (he just posted an update about how he’s still as enthused about his Instant Pot LUX model as ever – he has an earlier model than mine). I received my Instant Pot pressure multi cooker in early January 2014, and 7 months later I am still besotted with it. I have the latest model, the IP-DUO60, which has a high quality s/s liner pot with triply bottom that is very easy to clean and can also be used alone on the stove top. After a month of using the Instant Pot nearly every day and sometimes 2-4 times per day, I bought an extra liner pot so I could make quick pot swaps between the Instant Pot housing and the stovetop without having to stop, empty, and wash out the pot. This model also has a clever lid holder design that keeps drips and the lid off the countertop after releasing pressure and removing the lid. In my effort to prepare wholesome real food meals for my family, I have invested in an arsenal of kitchen tools, quality cookware for the oven and stovetop, as well as various small appliances, but to my surprise the Instant Pot DUO6O did more to reinvigorate my cooking than anything else I have ever used, even more than a stand mixer or a high speed blender. I’ve created empty cabinet space by donating now unneeded small and medium slow cookers (the IP has a slow cook function), a yogurt maker (the IP not only incubates the cultured milk, but it has a scald function for the first step that allows me to walk away instead of standing at the stove stirring), as well as a stockpot with steamer & pasta inserts. I find the IP to be such a useful appliance in my own kitchen that this summer I bought two more as gifts for my college aged nieces, and I plan to buy the IP-DUO60 UK version for my very busy SIL in London when it is released later this year. I think the IP would be very useful on road trips for preparing wholesome dinners and breakfasts, as it doesn’t release a lot of lingering aromas while it cooks. It would also be ideal for RV owners – its countertop footprint is a mere 12″ x 12″ but the multifunction programs eliminate the need for many other cooking appliances & pots & pans, or even a range top. I’m reading good reviews about Lorna Sass’ books and also Miss Vickie’s pressure cooking books. Do you have any first hand experience with the latter? They’re both pressure cooking pros so I’m sure you can’t go wrong with either one but it would be good to hear some opinions. I’ve got Miss Vickie’s big book of PC recipes and Lorna Sass’ Cooking Under Pressure, as well as at least 10 more PC cookbooks. There are 2-3 I never even open anymore. One of the big disappointment was the Cooks Illustrated/America’s Test Kitchen PC book which, believe it or not, gets many technical details wrong, esp for electric PCs. The other is I never used is authored by some guy on a TV shopping network, Bob Harden or something like that? I rally regret getting that highly rated book because while it’s for electric PCs (I have an electric Instant Pot DUO), ALL the recipes use mostly processed packaged foods that I don’t buy. Honestly, I know Lorna Sass is a grand dame of PCing, and she did a lot for pressure cooking a few decades ago, but I rarely reach for her book. If you only buy one book IMO it shouldn’t be this one unless you prefer to cook as simply as possible and don’t mind mushy carrots in your stew or soup. The recipes in Cooking under Pressure that I’ve made would have been OK in the 70s and 80s with my mother’s jiggle-top PC, but won’t pass muster for anyone who has even slight “foodie” leanings. 😉 I just haven’t been inspired to try more of recipes in Cooking Under Pressure, even though I could easily improve them by using advanced PC techniques and contemporary ingredients. I don’t know about her other books, but in that one she doesn’t make use of any advanced pressure cooking techniques that give better texture and enhanced flavor results (such as browning or sautéing first to develop flavor, interrupted or phased cooking so that faster cooking ingredients aren’t overcooked, and pressure steaming or Pot-in-Pot methods). The reason I say “until this week” is that my copy of Laura Pazzaglia’s just published Hip Pressure Cooking cookbook just arrived and it’s spectacular! It’s the culmination of her decade of careful experimenting with pressure cooking with many different PCs and in many different countries. In no particular order I like it because it doesn’t have a paper dust jacket to fall off and get dirty in the kitchen; the hard cover book stays open by itself and has a durable wipe-clean exterior; the pages have great layout with easy to read fonts and paper coatings; lots of great PC info and diagrams that demystify pressure cooker technical details and cooking techniques; recipes that aren’t difficult, but also don’t cut corners or steps at the expense of flavor and texture; wide range of recipes in every menu category from cuisines around the world, with explanations about the recipe details and ingredients; PC timetables are located at the back of the book for easier reference; well-indexed; and clear and appetizing photos. I’ve been reading Laura’s http://www.hippressurecooking.com blog for most of this year, so I wasn’t surprised to find her first book is superior to the others. She’d readily admit she’s standing on the shoulders of others who were on the PC scene much earlier. The one hesitation I have about recommending Laura’s book above all others is that from reading cookbook recipes reviews and PC cookbooks reviews in particular, I know there are some cooks who REALLY DON’T LIKE PC recipes with additional non-PC steps before or after PCing, like sautéing/browning ingredients prior to PCing to enhance flavor and appearance or putting the food under the broiler briefly after PCing to brown or crisp a food; they prefer dump-together, one-pot recipes that can be served up without fuss or further steps. In that case, I’d recommend the Lorna Sass or Miss Vickie books. Hip Pressure Cooking is for creative cooks who are looking to maximize flavor and don’t mind an extra step or two if it result in a more enjoyable dining experience. That said, Hip Pressure Cooking, IMO, balances the cooking work with effort economy. I am new to healthy cooking and am very interested in canning. Are there any multi-purpose electric pressure cookers that work for canning? There are only two of us, but I like to make large meals to freeze… and hopefully can. I also plan to start fermented foods. I really don’t want to get several different appliances. What would you suggest? Thank you! Your site (especially Facebook) has given me many, many great ideas! I love love love my pressure cooker and use it alot. I use it for vegetables and for stews and meat. I love the fact that I can cook my meals quickly. It is a wonderful tool to add to the kitchen. I have a digital pressure cooker. I found a useful guide for anybody who re looking to buy a pressure cooker but have no idea! Having used and loved my Instant Pot for over a year now, I’d like to jump in with a couple of comments. On top of the attributes noted previously, the IP has a built in sensor that detects if the food is burning. Early in my ownership, I cooked a recipe that looked like the water quantity was not right, but went ahead anyway. The IP shut off and gave an “overheat” message. The food was saved! I added more water and continued cooking our meal. A couple of times I’ve had that happen over the years with a stovetop pressure cooker and had to throw the food away! The IP is a set it and forget it type of appliance. You don’t have to stand there and babysit it. When it’s done, it keeps the food warm so you can be off doing something else or getting the rest of your meal ready. It doesn’t put out heat in the kitchen–because it’s all enclosed–so in the summer I love to use it. If I still had young children at home, I would definitely want this. Again, there is little heat coming off the appliance (safer), no annoying noise at all (it’s very quiet), and you don’t have to worry about getting distracted and forgetting it (no problem). I love to make bone broth with the appliance. It really pulls the flavor out of the bones, whether it’s chicken or beef. I heartily recommend Barbara’s “Pressure Cooking today” website. I have tried many of her recipes and have been very pleased. Many good things to cook, even if you haven’t taken the chicken out of the freezer! There are many recipes (ex: her Chicken Taco recipe) that you prepare and then have many leftovers to use in many different ways. This is a great appliance to replace your rice cooker as well. We eat brown rice, and the electric rice cookers don’t seem to cook it quite right so I end up doing it on the stove. The IP cooks it perfectly (Laura on “Hip Pressure Cooking” has a good recipe). I also will cook a large batch and then dehydrate it for when I am in a hurry or we are hiking. My only complaint about the IP is I wish they made an 8 qt model. Would love to be able to put more food in, maybe even get 2 chickens in at the same time. I’m not affiliated with IP at all, just a very happy customer. I have purchased two of these. Pressure cooking is a wonderful capability for the home cook interested in healthy balanced meals to have! I’ve been wanting to pressure can for a long time, unfortunately, I have a glass top electric range. Everything I’d read said that the glass tops would not support the weight of a full cooker. 🙁 I was so happy to find a recommendation for the Presto 23 qt Pressure Canner. I just received it a few days ago and can’t wait to can some chicken broth. Thank you for all the encouragement to cook healthy. I now have two electric pressure cookers – an Instant Pot DUO-60 and a Smart Instant Pot (all the DUO functions plus a few more function adjustments, bluetooth connectivity, a smartphone app, and ability to program custom scripts). I used the IP-DUO so much during the first year, I knew a second IP would get a lot of use, too. I said the ONLY thing on my wishlist for Christmas and my January birthday was the new Smart Instant Pot model – my sweet husband listened while there was a very good discount code on hippressurecooking.com! I already had an extra liner pot for my DUO. With 3 liner pots I can pressure cook up double batches or multiple recipes simultaneously and in rapid succession. The liner pots are so fast easy to handwash, too, though I often put them in the DW on the bottom rack when there is space. While two IPs do take up a lot of space on the countertop, if I’m not using the induction glasstop stove elements, I cook in one or both of the IPs set on a cork trivets on the stove’s glass top, under the fan an bright halogen lights. In fact, this past weekend I cooked all the food (except dessert, a cheese tray, and fresh fruit/veggie platter) for 30+ guests at the birthday party I hosted for my husband – the items cooked in the two IP PCs include 18+ lbs of organic boneless skinless thighs for a PC adaptation of The Silver Palate’s Chicken Marbella recipe; 2 batches (3 cups dry ea) of sprouted/GABA organic brown rice; 2 batches of refried pinto beans for 7 layer Mexican dip; a 1 pound batch of garbanzo beans for hummus; 1/2 lb dry huge Italian heirloom Corona beans; a dozen peeled and sliced beets (4 min!) for a citrus beet salad; plus some applesauce to use up 6-7 very large organic CSA apples that weren’t crisp anymore. Our non-air conditioned house stayed relatively cool while I was cooking, too, even though the Santa Ana weather pattern in the San Diego area was serving up record breaking 90°F temps (for mid-March) outside. Originally I planned to cater the party food for the party in a public park near the beach – a build your-own-taco-bar delivered by a local restaurant to the party’s park location was the most reasonably priced dinner catering option that would fit my party budget and still provide the “whole food” quality I wanted to serve ($15-18 pp plus delivery fee). But after doing some calculating, I decided I was up to the task of preparing most of the food myself putting the savings towards a really nice present I wanted to buy for my husband. The menu and quantity of food for so many people did require shopping and a full day of prep work/cooking and another day of kitchen cleanup on my part, but the Instant Pot took care of the cooking steps in very little time and almost no hands-on effort or supervision. I just set the program and got on with other prep tasks until the IP beeped that it was done. The party food turned out really well, if I do say so myself, and the guests seemed to enjoy it with gusto. Some guests were eager to take leftovers home with them. In fact, two of the male guests who are very into the food of their own cultures were very complimentary towards the bean dishes in particular. One guest is from Italy; he loved the giant, meaty but tender Corona beans that I simply tossed with EVOO, herbed sea salt, black pepper, and shaved Parmigiano reggiano cheese. The other guest is Mexican-American; he could detect the refried pinto beans in the 7 layer dip were prepared from scratch and not canned. 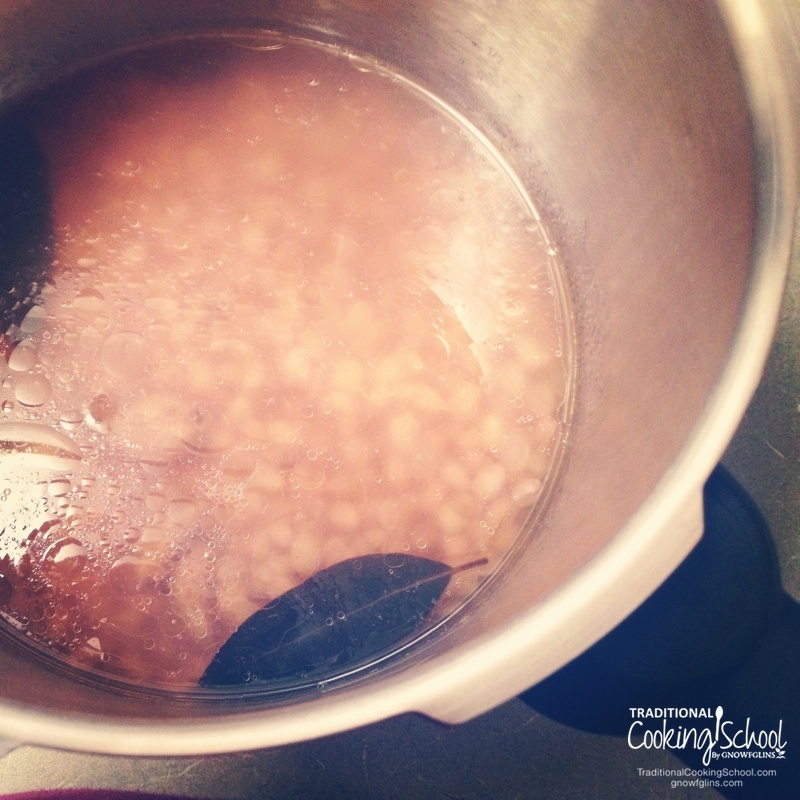 He moaned about the long cooking times for homecooked beans, but was very intrigued when I told him that soaked beans cook beautifully in very little time in a pressure cooker. Before he left the party he had looked up Instant Pot online on his phone and decided to buy one. My teenage son says Instant Pot needs to start paying me a commission because already at least a half dozen people who have bought an IP on my recommendation. LOL. What’s wrong with aluminum pressure canners for cooking? I was thinking of getting an All-American, it even comes with a recipe book. I don’t believe one can use a pressure cooker to can foods. I don’t think it would build up enough pressure to take care of the jars of food. Don’t know how else to put this. Thank you for your thorough classes. I am just getting started and am excited that I am doing somethings right. I love being able to can beans and meat to have that food on hand for those busy, crazy days. You mention your stove, I thought the Instant Pot was a stand alone. I have heard the cooking times are fast, but don’t the pots take time to build up the pressure? Is it like crockpots, where most everything tastes the same? I know my brother loves his pressure cooker, but I really don’t have any knowledge of them. I have seen other health gurus talk about pressure cooking (and see the Instant Pot recommended). Your class sounds very tempting, I may be signing up if you will answer the questions for me. Wardee has both stovestop and stand-alone pressure cookers. When she wrote this article, she only had the stovetop so it’s written from that perspective. Yes, it takes 5 to 30 minutes to come to pressure, depending on what’s in the pot, the food’s density, and it’s temperature. everything is sorta the same in a crockpot, varying the spices tho. mexican, thai, italian, southern soulfood. but what a crockpot does, it does fantastically. broth, beans, sauce, roasts, easy chickens, warm up frzn meatballs in frzn soauce after lunch while you leave for the afternoon, coming hlme to a readymade dinner (put on sub rolls with a bagged salad). plus you can cook while sleeping, dish it out to cool while breakfasting and load up the fridge and freezer before lunch is even thot of. frikkin awesome. what they do, they do excellently tho! I do need to learn to cook with spices. I don’t use them often. This class is wonderful so far! I pressure can more than I pressure cook, so I am excited to do more cooking! It is just one of those things a person wonders why they didn’t do something sooner. I believe we get into habits and without focusing on changing, we continue in established habits. This Instant Pot video and information looks very good. I will continue to find out more about it. The PC pot I own is a Fargo. I have never done dessert, so want to try. I do a lot of Pressure Canning every year; summer is pickles, relishes, carrots, beets, green and yellow beans, sauerkraut, sausage links, peaches, dry beans, etc. Fall is apple sauce, apple pie filling, apple butter, plums, tomatoes, tomato juice, tomato soup, spaghetti sauce, grape juice, chutney, pumpkin, venison, beef, etc. When I was first married I did water bathed canning but when my mother-in-law told me I could have her pressure canner that she no longer used, I switched to pressure canning. I love this method! So, for the last 20 + years I do as much canning as possible under pressure.